If you didn't get a chance to see them in theatres - or you didn't want to see them enough to shell out the increasingly large wad you need to get you through a movie - two films based on books came out on DVD and Blu Ray this week. 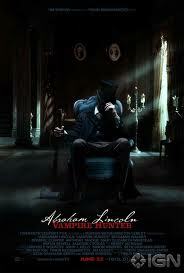 You can read my take on the Abraham Lincoln; Vampire Hunter movie. Fair warning and full disclosure: my husband worked on the film based on Seth Grahame Smith's book. I may not be unbiased. :) The movie, directed by Timor Bekmambetov and produced by Tim Burton and Jim Lemley, stars Ben Walker, Anthony Mackie, Dominic Cooper, Rufus Sewell and Mary Elizabeth Winstead. 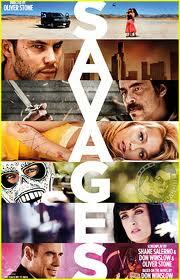 Check out Savages reviews here Or see the trailer here. I'm not sure why but SAVAGES is the most searched book/movie title of my blog. Is it because the first chapter of the book was one word and that word was the F-bomb? Savages, directed by Oliver Stone, stars Taylor Kitsch, Aaron Taylor-Johnson, Benicio Del Toro, Emile Hirsch, and Blake Lively. Don Winslow, the book's author co-wrote the script with Stone. PS There's a fascinating tidbit from The Playlist: "Winslow is teaming up with author Chuck Hogan, who wrote the crime novel “Prince of Thieves” -- upon which writer-director Ben Affleck’s “The Town” was based—the pair are working on a currently untitled script that is a contemporary crime thriller set to be produced by “Savages” producer and co-writer Shane Salerno. The plot will revolve around two men set to collide amidst the sort of nefarious supporting characters that tend to populate the creative worlds of Winslow and Hogan. The pair will each focus their attention on one of the two lead characters, and eventually turn it into one comprehensive script that Salerno will then shop around to studios. Could be an enthralling crime caper or one exciting writer’s workshop, we’re eager to see"
My husband wants to see Abraham Lincoln:Vampire Hunter, on dvd. Is that as painful to a moviemaker as saying I'll read the book from the library is to authors? Ouch! Ha ha, yes I think it is. The 'ya gotta see it on the big screen' school of thought.